Finally ready for Operation flat surface. Milling my time my away. Austenitic stainless steel, that frequently has seen high temperatures is not really soft. Sunday update: Anders couldn't keep his finger away from the TIG. It's ready! Saturday morning. The Salt Slush Team has arrived. The coffee has been consumed the latest car dreams has been discussed. A couple of new amazing projects has already been agreed. All important stuff under the table has been dragged out. A smartphone zombie is drifting around in the workshop waiting for the action which is about to happen. What kind of action? We're just about to cut the navel string and let our racer touch the shop floor for the very first time. Various lowering strategies are being discussed. Under the build table Karl-Johan found an old friend. The old S80 automatic transmission which he once a upon a time was project leading. A moment of reflection. 50% completion. No victory yet. Just pure excitement. Yes, we need to mount the correct wheels and yes, we need to adjust the ride height a little, but it looks nice. Magnus is here adjusting the ride height, or at least working with the upper trailing arm. Who would like to take a ride with Mario? Cina also felt the urge to celebrate the on-wheels event. In summery: Perhaps a small step for mankind, but a giant leap towards the salt for Salt Slush Racing! It's low. Keep in mind the Amazon wheels are still standing on the table, which means that in addition the car will come down approximately 100mm (4´) more. But we will most likely increase the ride height to 60mm. In total, this means that it will come down approximately 80mm compared to this picture. And yes, we admit, we can watch it for hours. The low, slightly drop shaped body in bare sheet metal...is...nice...and we really like it. Rome was not built in one day. Neither the Salt Slush Racing Volvo Amazon. But we're tooling our way to success step by step. We practise the do-something-almost-everyday strategy. Design, decide, build, order something everyday then all of a sudden you'll get there. Next big step is now to remove the vehicle from the build table and let it gently touch the holy garage floor for the first time. This will happen really soon now. Meanwhile, here's a few pictures of details that we like. Anders is in a sheet metal forming period. Which is good. He's especially proud over the right part of this section. A complex shape which is too complex to understand matematically, which is why he just did it without thinking too much. Paul, a SSR friend with certain experience of land speed racing on the Salt Flats, took the opportunity to inspect the vehicle while it's still on the table. Material happiness = EFR 9180 delivery ! Can material gods really bring you happiness? Those of you who doubt this have obviously not received a 9180 EFR turbo suitable for 1000hp! It's a piece of art with its precision cast twinscoll turbine house, integrated wastegate and milled compressor wheel. When you move your shaking finger forward to spin the turbine wheel (the turbo community equivalent to tire kicking) and do feel how easy it is to spin, thanks to the big Titanium-Aluminum turbine wheel and ceramic ball bearing, you hesitate for a moment, then you go for it. And yes, you can almost hear engine roar and boost pressure raise! One hour earlier I felt like I was overloaded with work on a depressing Wednesday in February. Not anymore, cause I've taken the Turbo cure! Is it a meat mill? No, it's the beauty in another angle and another light. Speed is not an illusion ! I am not a mathematician or physician but I know for sure that speed is for real ! Just take a moment and enjoy some of Mercedes Benz historical land speed racers and race cars ! I had the opportunity to visit The Mercedes Benz museum in Stuttgart. It was extremely nice and inspiring and without going into details, the cars for speed and racing are fantastic. Such design and engineering meisterstück ! Well kept together via the thesis "Form und Funktion". Make speed not war ! Moonlet Wednesday evening in February. Was tonight a moonlet night in old Mexico? No, and Speedy Gonzales was not around either. Did we get a message from outer space? No, there was no extraterrestrial objects falling from the sky. We just received some legendary speedy hub cap from Moon Equipment, destined to make our hot rod Volvo Amazon Station Wagon act like horizontal rocket in a moon like landscape. Not only Anders is happy. A Gasser? A Track Racer? A Dragster? No it's Landspeed Racer ! Our Land Speed racer is coming together step by step. Our coffee drinking and talking, but determined, team is slowly tooling its way to The Salt. As our creation is taking shape we're starting to get an idea of the final result. It's not a gasser because it ain't high and it doesn't have green or yellow window. It's not a dragster cause it will run on narrow tires and it's not a track racer since it will be somewhat heavy. It starts to look a little bit like of everything above. Actually I get the feeling that it will not only be fast as a shark but as well cool as ice. 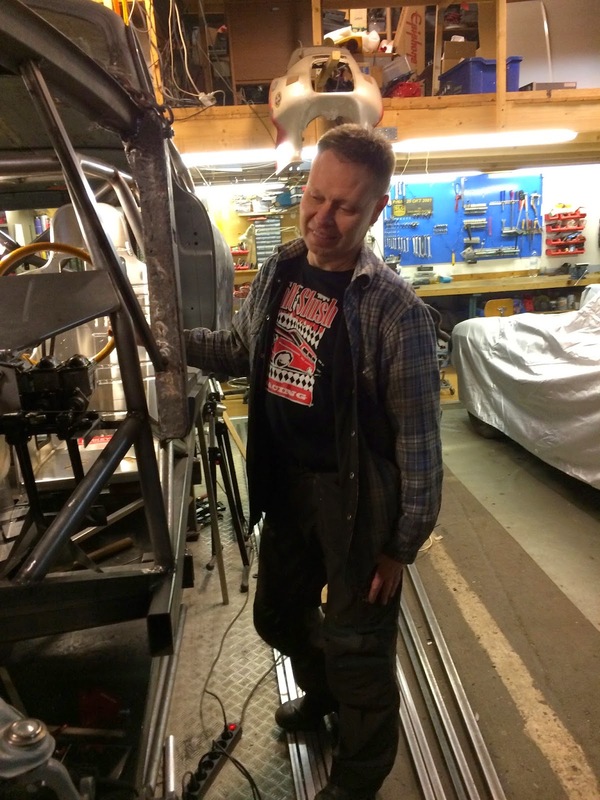 Karl-Johan happily provide design guidelines to Robin, the Race driver. A fast guy in search for more speed and control. Anders is having a machine moment when working with his self-made sheet metal forming machine. Carina was populating our web based Speed Shop with more good stuff. Magnus is concentrated since he wants to leave the workshop with the same 10 fingers he arrived with. Mario and Gitte are working hard on their newly painted Volvo P1800. Two enablers. Boost pressure = happiness. The future home for our feets. Yes, we know, the most important pedal is still missing. Anders waiting for parts fabricated by Magnus. CAD (Cardboard Aided Design) supported fabrication. Here's the final state-of-the art bearing support ready to be welded in place. Anders evaluating if the part is according to our strict standard and intentions. Magnus keeping a polite and humble attitude ! Yes, we all approve it, we are good to go! Soon we will be in control !